Please Join Us For Two Great Events At Our Pop-Up Adventure Playground. Friends, you have two great opportunities to help create and then enjoy something truly incredible (that doesn’t exist anywhere else) in the very heart of downtown Philadelphia. Over the past week, Public Workshop has worked with over seventy teenagers and young designers to design-build the beginnings of a fantastic play landscape in the Pennsylvania Horticultural Society’s PHS Pop-Up Garden between 19th and 20th on Walnut. Initially taking the form of a series of soaring mountainous islands and coves, the space will radically transform beginning on October 11th as families, children, and YOU collaboratively ‘build’ their own stories, play, and structures on and around these forms. Arising from simple materials that one can find at any hardware store, this engaging place making project explores the roles that ‘play’, a civic-oriented DIY culture, and young adults can serve in Philadelphia’s future. This project is part of Tiny WPA, a program initiated by Public Workshop that places young adults at the forefront of stimulating community engagement and civic innovation in Philadelphia by empowering them to design and build improvements to the City’s public spaces, schools, and micro infrastructure. 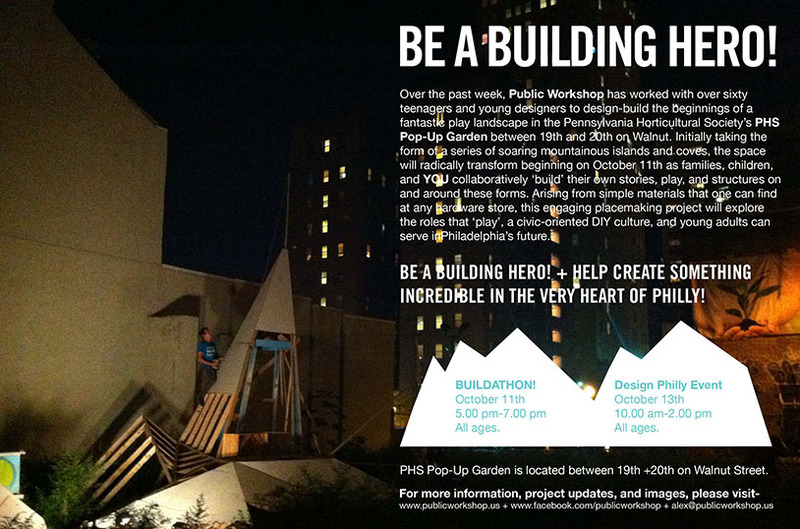 Please join us on October 11th and October 13th for unique participatory design-build activities for all ages; hours of tinkering, collaboration, and adventure; and conversations about the state of play in Philadelphia and the transformative roles our young adults can play in the design of our city. The pop-up playscape and tinkering space will be coming down with the Pop-Up Garden on October 16th, so you won’t want to miss these events and your chance to be a part of something great. Don’t miss the great press that we’ve gotten for the project in Next American City and Hidden City. Stay tuned for a TV spot on WHYY and other articles coming soon. Incredible thanks to the Pennsylvania Horticultural Society and their staff for making this project possible. And while we have students from various Philadelphia schools have participated, we could not have done this without help from the staff and students at the Science Leadership Academy and El Centro.